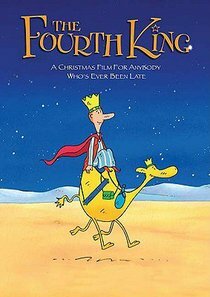 A fanciful 'what-if' tale about a fourth Wise Man and his camel who were late for their rendezvous with the other Three Kings. The pair of travellers set out in frantic pursuit, but encounter many setbacks&... and all the while their distant star seems to grow dimmer. The journey seems hopeless and they arrive late-or do they? Their encounter near Bethlehem with a young family running away from soldiers make a strong impression on Mazzel and Chamberlain-and their lives are not the same from that day on. This enchanting story is filled with charm and gentle humor and will warm hearts during a cold holiday. Once upon a time, three wise kings came out of a distant land and followed a star to the little town of Bethlehem to honor a newborn baby. But few people have heard about the fourth king, named Mazzel. With his faithful camel servant Chamberlain, Mazzel is delayed by a cry for help and misses his rendezvous with the other three kings. And so this strange tale begins? The pair of travellers set out in frantic pursuit, but encounter many setbacks? and all the while their distant star seems to grow dimmer. The journey seems hopeless and they arrive late-or do they? Their encounter near Bethlehem with a young family running away from soldiers make a strong impression on Mazzel and Chamberlain-and their lives are not the same from that day on. This enchanting story is filled with charm and gentle humor and will warm hearts during a cold holiday.